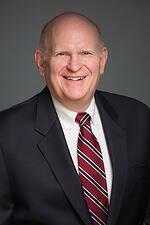 Richard is a seasoned financial executive with over 35 years of experience in finance and accounting management. He is a strong and effective executive who is not afraid to be “hands on” when necessary. His diverse industry experience includes real estate, utilities, energy, high tech, telecommunications, internet and manufacturing; scope ranges from startups to global Fortune 100 companies. Richard began his career in public accounting, after which he joined the real estate development subsidiary of Portland General Electric / Enron (“PGE”) and through increasing responsibility advised PGE’s non-utility businesses on proper and efficient tax treatments in the real estate, energy efficiency, independent power and telecommunications / internet industries; his final position was Director of Taxes at Enron Broadband Services. Richard then joined a startup real estate development company funded by private equity where he was responsible for accounting, finance, tax, insurance and risk management functions during the Company’s growth stage (assets increased from $100 million to $1 billion). Next, Richard joined a family owned business at a building and restructuring stage. He was instrumental in recasting and expanding the accounting team to build a significantly stronger base for the company moving forward, facilitating many strategic outcomes. Immediately prior to joining CFO Selections, Richard was a consultant at Intel, integrating its subsidiaries ERP systems with the parent company to increase internal controls and consistency in company-wide financial reporting. 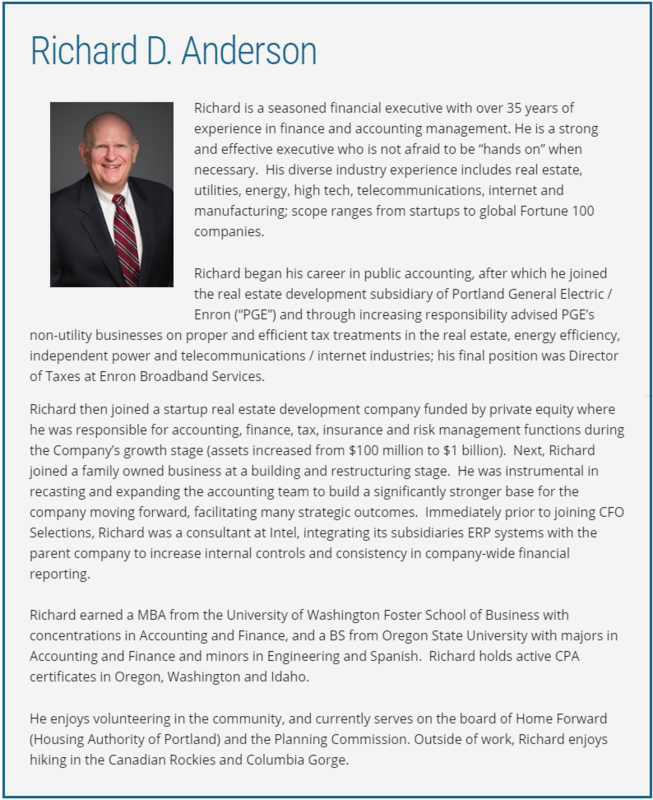 Richard earned a MBA from the University of Washington Foster School of Business with concentrations in Accounting and Finance, and a BS from Oregon State University with majors in Accounting and Finance and minors in Engineering and Spanish. Richard holds active CPA certificates in Oregon, Washington and Idaho. He enjoys volunteering in the community, and currently serves on the board of Home Forward (Housing Authority of Portland) and the Planning Commission. Outside of work, Richard enjoys hiking in the Canadian Rockies and Columbia Gorge.